American DJ Fusion FX Bar 4 Three effects in one chassis. Effect 1 is a green 4.9mw laser that projects geometrical patterns. Effect 2 an LED based Tri colored moonflower that operates sound actively. 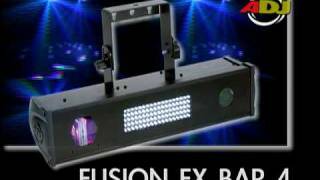 Fusion FX Bar 4 Effect 3 a white LED variable speed strobe light. Great for house parties, nightclubs, lounges, bands and mobile DJ's. Three operating modes. Linkable master slave via XLR or DMX cable. Can be run using the UC3 remote or DMX 512 control functions turn on/off specific effects. Stand alone operation sound active. Considering purchasing the American DJ Fusion FX Bar 4? Have questions? Ask people who've recently bought one. Do you own the American DJ Fusion FX Bar 4? Why not write a review based on your experience with it. 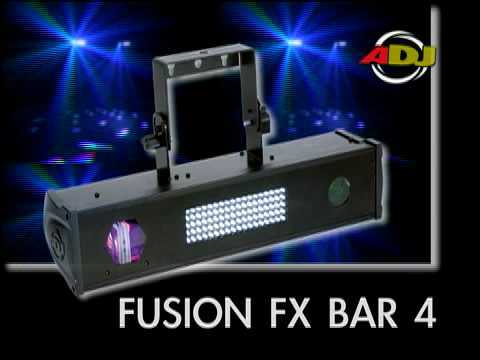 Seen a video for American DJ Fusion FX Bar 4 online or have you own video? Check out American DJ Fusion FX Bar 4 on DJkit.com!